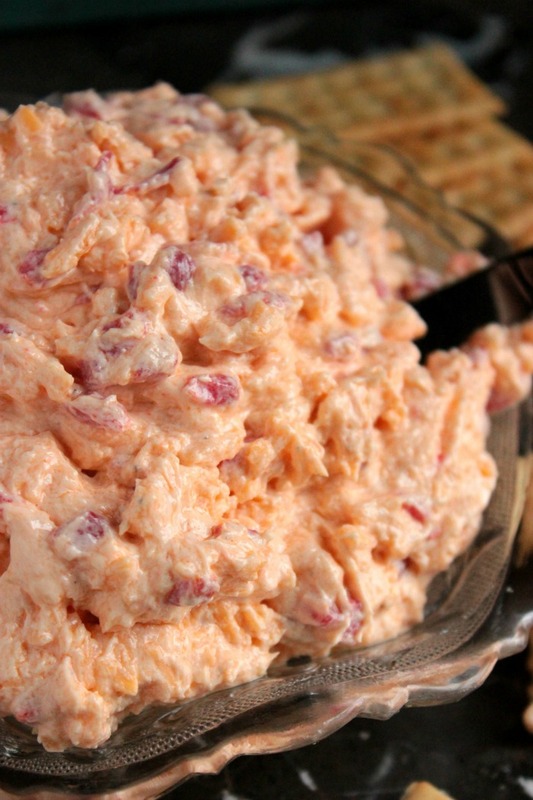 Every good southern woman should have a homemade Pimento Cheese recipe in her back pocket! With the recipe from my grandmother’s recipe box and a few tests in the kitchen, I made some of the best we’ve ever had! It’s another beautiful Monday down here on the North Carolina Virginia state line. I only say it’s a beautiful Monday morning because I’m snuggled up on my couch. My puppies are cuddled with me while the snow falls outside and my fireplace burns on the other side of the living room. I use to hate Mondays, but this whole working from home on Monday deal is really giving me a whole new outlook on Mondays. 🙂 Well, I mean I still have to work but it’s not so bad when you can do so in your pjs and fuzzy socks. This is the second time it’s snowed this year (if you don’t count Friday since that was just a little flurry) and everyone is already going crazy. I’m telling ya, once the snow starts to fall it’s like everyone here looses their dang mind. I just tend to keep to myself when it snows while avoiding the roads and stores. I don’t really mind the snow but I know there are a lot of people that hate it. If I had to get out there and deal with the crazies during the snow I’d hate it too. I do hate it for Thomas though. He doesn’t really get “snow days”. When it starts snowing he knows that he’s getting ready to have to start working even more. He got called into work last night around 8pm and didn’t get home from plowing snow until 3 this morning. He got into bed at 3 and was back up with his alarm at 6:30 am to start working again. 🙁 I’ve got my fingers crossed that he’ll get to come home early today and get some rest. But that’s enough talk about all that, let’s get onto the Homemade Pimento Cheese! I found an old Homemade Pimento Cheese recipe in my grandmother’s recipe box a while ago, made a few small changes (like the amount of mayo and garlic) and came out on the other side with some of the best homemade pimento cheese that I’ve had in a very long time. I’m not sure where you’re at when you’re reading this or if you’re from the south or not but Pimento Cheese is a thing around here. Pimento Cheese is like a BIG thing around here, it’s almost as important at the perfect homemade chicken salad recipe. (Which I have yet to master). 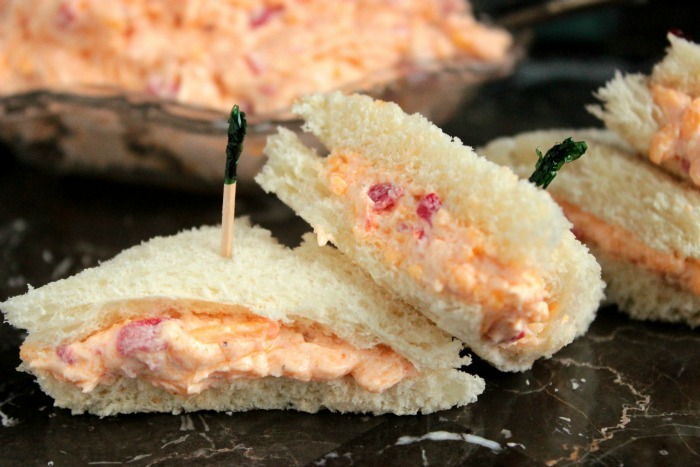 I mean, if you go to a baby shower, wedding shower or house warming shower, you better believe that there will be little Pimento Cheese sandwiches or Pimento Cheese Rolls right alongside of the chicken salad sandwiches. If you’re planning a menu for a little party and the question is “What kind of little finger foods should we have?”, you should already know to put down little chicken salad sandwiches and little Pimento Cheese sandwiches before you move onto anything else; they’re just a given! 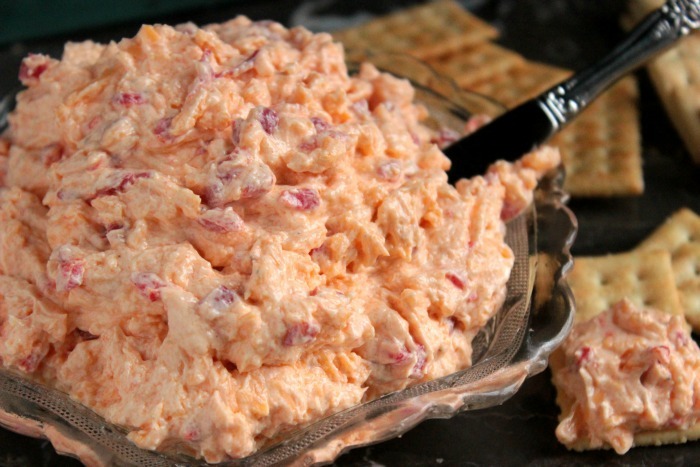 Let me be honest with you though, I haven’t always been a Pimento Cheese fan. Heck, I really didn’t even know what was in Pimento Cheese when I was younger. I knew that it was some type of cheese stuff but I didn’t even know that a Pimento was a pepper until like 6 or 7 years ago. Oops….. I didn’t start to like Pimento Cheese until I got older, Thomas didn’t even care to try it until we just happened to see it on the menu at the bistro last year. When we moved into the apartment last fall, we were so happy to be able to walk to a couple of the restaurants downtown. But anyways, when we were there for dinner on night, Thomas ordered the fried green tomatoes topped with Pimento Cheese! This totally took me by surprise because he’s not a Pimento Cheese cheese guy, he’s not into anything that’s made with mayo! However, he says that he’s trying to be even more willing to try new foods so he thought he’d give them a try. Let me tell you, Fried Green Tomatoes are delicious (we already knew that) but topping them with Pimento Cheese is phenomenal. Is phenomenal an ok word for them? Too Much? Well it’s what I’m going with! I didn’t add quite as much mayo since I know Thomas isn’t really a fan and I did add a bit more garlic because well, it’s garlic. haha. It turned out so good. I packed up a few tubs to take to the office with me for taste testing and that was that. I now have a “go-to” homemade Pimento Cheese recipe! 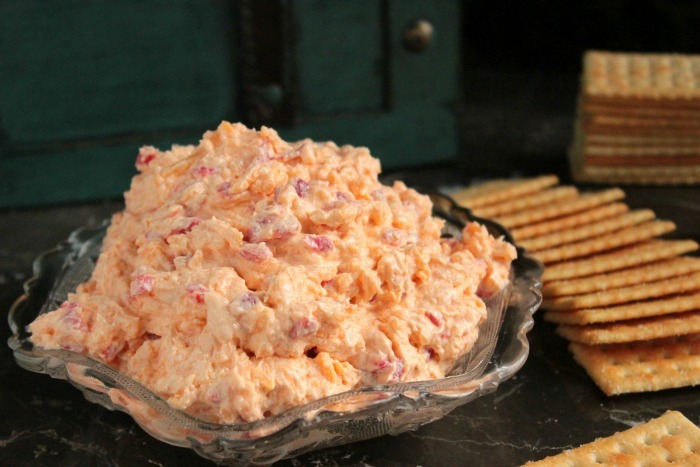 Going to make Pimento Cheese at home? Try it with crackers, make a Pimento Cheese sandwich or heat that up and bit and make a Pimento Cheese grilled cheese! I mean Pimento Cheese on crackers is good but Pimento Cheese inside of a sweet Hawaiian roll is amazing. 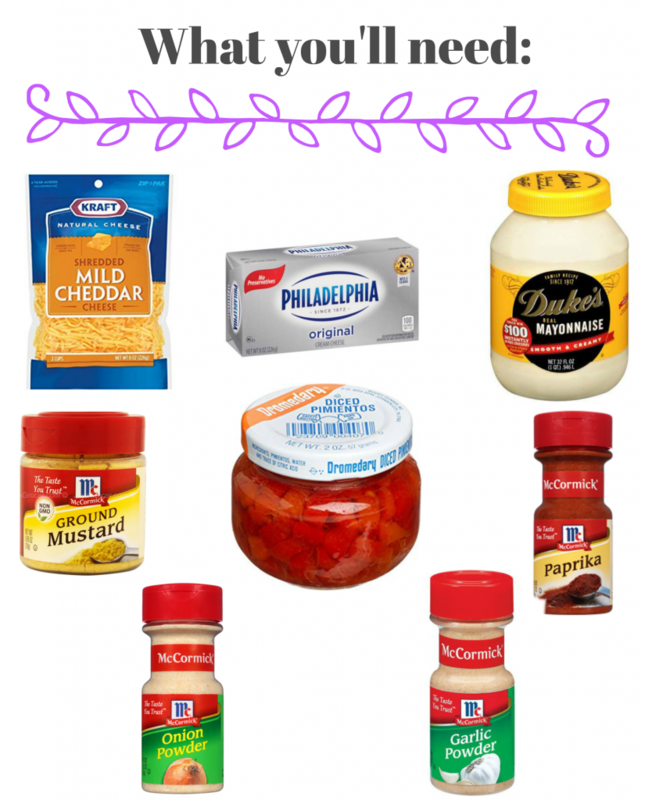 If you love Pimento cheese, take a look at these recipes because they all either use pimento cheese in the recipe OR are pimento cheese flavored recipes! I’m in love with all of them! 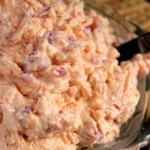 Every good southern woman should have a homemade Pimento cheese recipe in her back pocket! With the recipe from my grandmother's recipe box and a few tests in the kitchen, I made some of the best we've ever had! With an electric mixer, mix the cheddar cheese and cream cheese together. Mix for 2-3 minutes. Add in the mayo and mix. Add in the garlic powder, paprika, onion powder and dry mustard. Stir everything together. Refrigerate for at least 10-15 minutes before serving. I love this homemade version!! 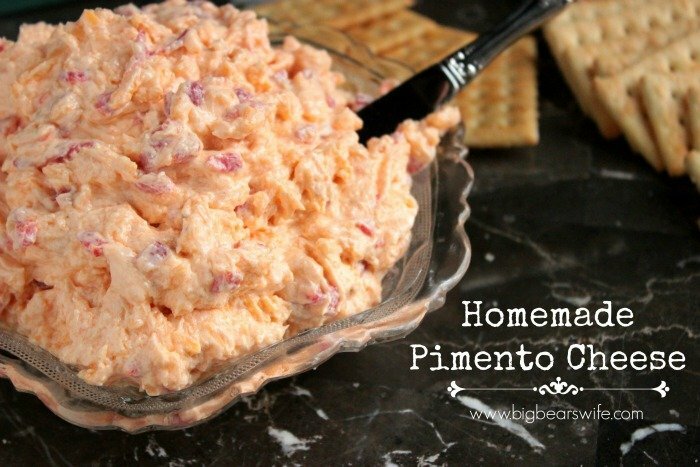 So many memories of pimento cheese — growing up in Georgia! This sounds so much better than the store bought version. ALSO, I can’t WAIT for Mondays to be from home… starting in June! Yes it is, and it’s a good time for me to make it again. Thanks for this recipe. I don’t mind Monday’s anymore either now that I work from home! Changes my outlook on it for sure. 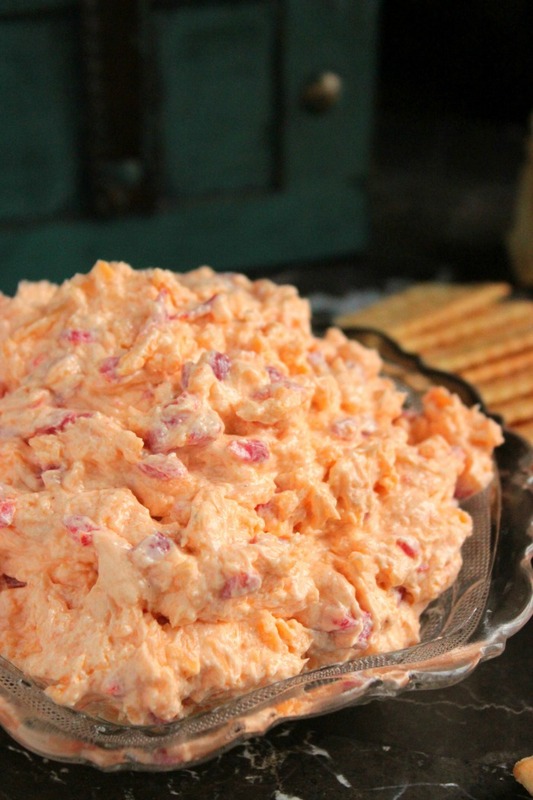 Lol love this pimento cheese recipe- have always wanted to try making it at home! I wish I could scoop up some of your pimento cheese right off my laptop screen. 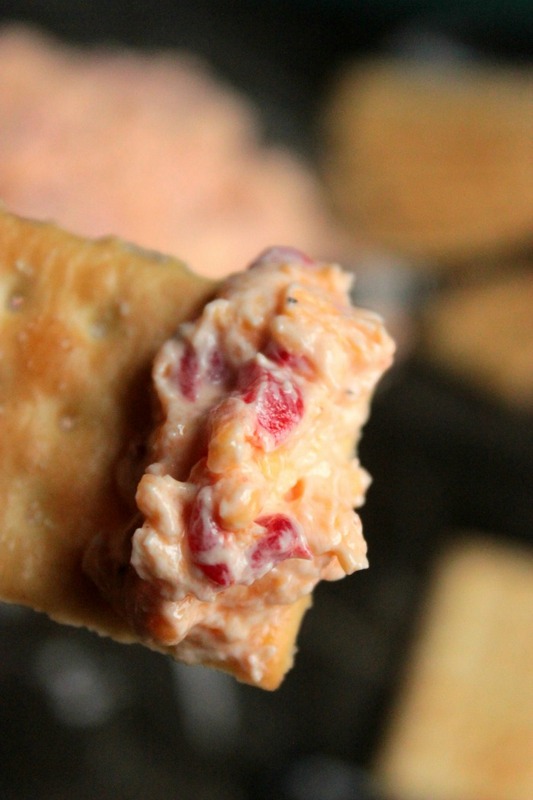 Pimento cheese is something I’ve always wanted to make at home, but have yet to do it. Yours looks fantastic! Oooh, I just want to plunge into that! Looks fab, I’ve gotta try it. And those tiny sandwiches look perfect! Oh my GOSH! Are you serious that I can make this? I love it. I love green fried tomatoes. OH JOY!! I must make this. (as soon as I recover from 4 days away with the grandkids and an icy drive home)!! I think it would be pretty looney around here too if it sometimes snowed. It’s bad enough when there is a deluge (like this morning!!). 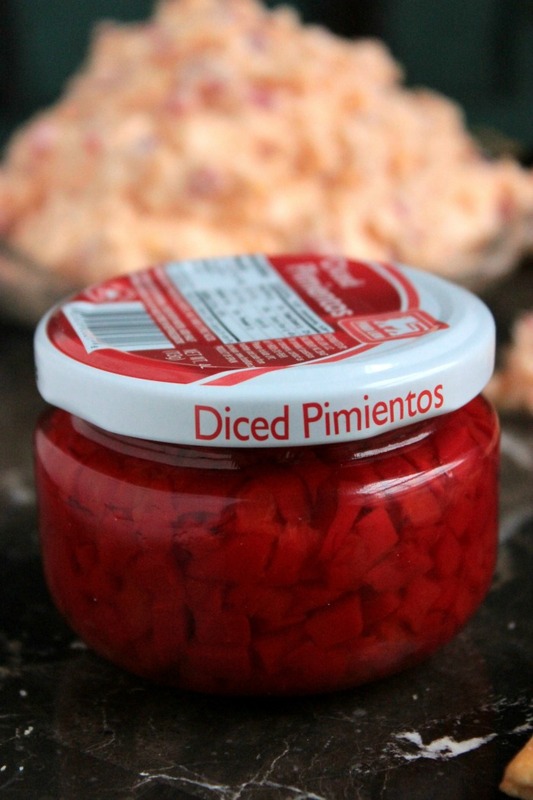 Pimiento sandwiches or dips were at so many parties when I was growing up. Must be because this Southern treat trickled down here, even though this is totally not the south! Save me a sandwich!!!! One of the things I love most about the internet is how it’s opened doors and windows into food traditions outside the ones I grew up with. I am a Northern girl who grew up in New York — I can tell you all about the perfect pastrami sandwich and why New York pizza is superior to all other pizza, but I’d never even heard of pimento cheese until a few years ago. I love that you’ve updated your gramdmother’s recipe and transformed it into something that is just right for you. I haven’t had pimento cheese in years, but I love it! It’s one of those wonderful recipes that kind of slips through the cracks I guess. Hops your hubby gets some rest! I have a total weakness for pimeto cheese. It never occurred to me to make it myself, though! Duh! 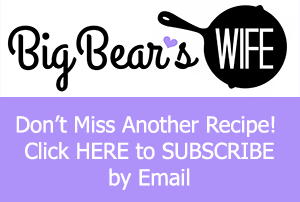 I love the sound of your recipe – this could be new favorite!! Girl you are rocking this cheese in a big way. I love it. The photos are amazing. I could put this on everything and probably will. I’m trying to institute something called the Monday Rule. It’s basically a rule that you never book any appointments, conference calls, or meetings on Mondays. Essentially you keep Mondays free to get your week started off right. So no distractions. Just use Monday to get caught up on anything from the weekend that got put off and get a really good start on your week. It’s so hard though because things come up. But I think I’m going to really commit to it for awhile. That’s the best idea ever!!!!? Made this for a Derby party this past weekend. 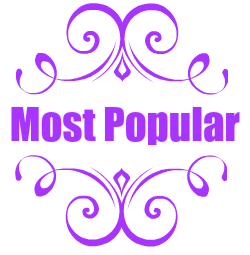 It was such a huge hit! Everyone is asking for the recipe! YAY!! I’m so glad that y’all loved it!! I cut the cream cheese in half just personal choice. I must say…… This is the best pimento cheese I’ve ever made. The dry mustard was a great idea. Louisiana girl here appreciates u sharing this recipe!!! I’m so glad that you liked it!! I made this and it is delicious. Thanks for this yummy recipe! Welcome! So glad you liked it! In an airtight container in the refrigerator, you can keep it for up to two weeks. ooo I hadn’t thought to add sugar to mine, maybe I’ll try that next time I make it! So sorry to hear that you had to have chemotherapy though! I have a friend that just went through that. It’s so awful :(. I hope you’re doing ok now! I am not a southern girl but I love pimento cheese to a fault..I am just wondering the Mayo that you are using is it real mayo or Miracle whip? Duke’s is THE only true Southern mayo on the market? Never use Hellman’s!!! too much sugar. Not natural like Duke’s!!! Yep, you had me with Duke’s!! Only mayo to use!! I have another recipe I use, but will def be trying yours, looks delicious! Duke’s is the only one! And it has no sugar! Though this is not the original southern recipe, this is good! Sharp and extra sharp cheddar is Charleston’s choice. When you start adding or subtracting, it is no longer the recipe. Like all others , it is fun to experiment. Try a little grated fresh onion? I have lived in North Carolina my entire life, but have just recently discovered a LOVE of pimento cheese. Mama didn’t like it, so we never had it around the house unless deddy asked for it on a rare occassion. It seemed simple enough to make, and I’m so glad I used your recipe! It is amazing! My husband, who is from Ohio had never had it until tonight, and he loved the garlic. Thank you for sharing! I spent most summers in NC growing up and got addicted to Stan’s pimento cheese on white bread with a cheerwine. I live in IL and they just started selling pimento cheese at Walmart. It’s not nearly as good sadly. I’ve tried to make my own a couple of times and it was awful! Don’t use miracle whip and sharp cheddar. Or try to melt it all in a saucepan haha. This is the first recipe I’ve seen using cream cheese though so I need to give it another shot. Thanks for sharing your grandma’s legacy with a homesick Yankee wanting to be back in the mountains. What type of cheddar cheese is used? Mild or sharp? you can use either one. I normally use mild but I’ve made it with sharp and it’s still tasty. I left it as just “cheddar” so that everyone could pick for themselves if they wanted mild or sharp. I’ve used 1 cup cheddar cheese and I cup parmassean cheese, instead of 2 cups cheddar. Adds a unique, salted flavor. I’ve also replaced mayo with sourcream. This is perfect! Try on toasted sandwich with bacon…yummmo! Make this at least every other week. <3 love the idea of using parmassean cheese! Hi Penny! I’m so glad that you liked the recipe! oooo a grilled pimento cheese sandwich sounds amazing! We are from Mississippi. Mom always made hers with velveeta & pimentos & mayo. No Dukes Mayo here in Texas, so we use Kraft. Not Miracle Whip. Mayo is simply milder Miracle Whip. My daughter and I use a meat grinder to grind up the velveeta and pimento – makes it easier to manage. We use some bottled roasted red peppers in it too, just to taste. We love those roasted peppers. 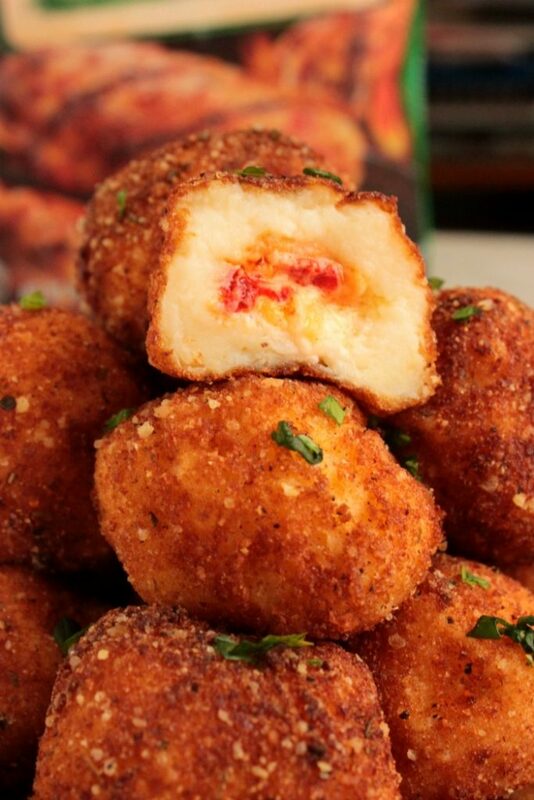 Can mix cheddar or other cheeses and make it like you want it. Sounds like another great version of pimento cheese! yum! Pat George- I have found Duke’s at HEB. And the reason why I bought Duke’s instead of Helman’s (the ONLY mayo my hubby would use) is because of a delicious pimento cheese sandwich a co-worker made and she swore only Duke’s would do. And guess what? We love Duke’s now too. I only use Duke’s and live in Texas. It’s available at Kroger, Tom Thumb, Central Market, and many HEB stores. Great recipe, thank you, we really loved it! 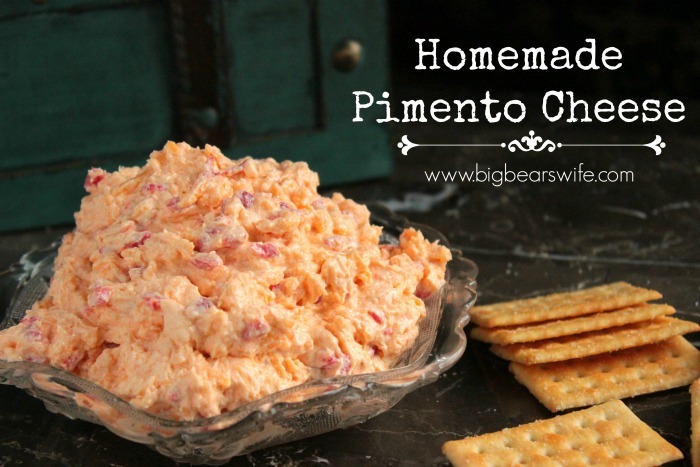 This is the best pimento cheese recipe I have ever tasted. I have been eating it non-stop over the past 2 days and declaring “this is the best pimento cheese in the world!” after every bite (I have no shame). Thanks for sharing!! <3 <3 <3 I'm so glad to hear that!! This is a lot like how I make it. Sometimes, I use 1/2 smoked Gouda, 1/2 sharp cheddar, and it is fantastic. It’s also good with potato chips and tortilla chips as a dip. It’s awesome spread of toast and crostini as well. If you make it as a grilled cheese, do yourself a favor and add bacon and tomatoes. oooo I really need to make a grilled cheese with this!! yum! My favorite way to eat pimento cheese is on a burger….it transforms a regular ol’ burger into the Cadillac of burgers. It’s a hit at cookouts! Thanks for sharing your version! YES!!! I also love it stuffed inside the burger! If you like pimento cheese, but don’t like biting into a large piece of pimento, put the pimentos into a small food processor and pulse until it is the consistency you like. I use half mayonnaise/half Miracle Whip in mine. Thank you!! I’m so glad you liked it! I can’t wait to try this. I was in Atlanta last weekend visiting my son and we went to a music/food truck festival while I was there. We got this mac and cheese with bbq pulled pork on it and it had a spoonful of pimento cheese on it as well. It tasted so yummy and I’ve been craving it every since. So I did a search on pimento cheese recipes and found yours. I’m going to the store right after work and that’s what’s for dinner at my house tonight…YAY!!! I hope that y’all love it Lauri! I bet the food truck rodeo in Atlanta as awesome! We go to the on the Raleigh, NC every year and Greensboro! Our city just started one up this year too! I live in Montana and I made pimento dip kind of as joke for a “southern BBQ” themed potluck because I didn’t know what else to bring. After googling “southern appetizers”, I settled on pimento dip. Talk about a hit! I’m now required to bring a batch to all work festivities. <3 hahahaha that's awesome! I love it! I grew up on homemade pimento cheese; however, this is the best. I have shared it with friends from Alabama, Georgia and Tennessee. They all liked it. Thanks for sharing. Yay! So glad to hear that you liked it! Can you use regular mustard instead of dry mustard? I’ve never tried it with regular mustard so I’m not sure how that would turn out. Hi there! I am wanting to use this recipe to make little sandwiches for my daughter’s birthday party. How many do you think this recipe would make? Being from Virginia, I was raised on Pimento Cheese sandwiches! But the store brands were disgusting, so I always made mine homemade………..until I discovered “Palmetto Cheese” brand!!! It is over the top good. I could tell it had some spices that were subtle, but just added a little kick. I also saw that it had cream cheese in it. Sooooo…….I’ve been looking for a recipe that I could make at home that would taste as good as the Palmetto Cheese. I think I may have found it!! Based on what I read in your ingredients, I may have hit pay dirt!! I plan to try this soon and hope it’s as good as it sounds!! Thanks for sharing! Hey Linda! I’m not a fan of the store brands either. Homemade Pimento cheese is the only pimento cheese I want to eat haha. I hope you like my version of it! I’m a second generation Yankee, but my grandparents were from the South, so I’m familiar with pimento cheese. There aren’t any good store-bought brands here, though, and Duke’s Mayonnaise is unheard-of. We have Kraft or Hellman’s. Can you make a suggestion about which is more like Duke’s? How long does this keep? Interested in making for a Baby Shower in SC? In an airtight container in the refrigerator, you can keep it for up to two weeks and it’ll be fine! Fantastic! I had to taste several while making tea sandwiches! I made tea sandwiches for my uncles 95 Birthday Party! I used the very thin bread from Pepperidge Farm. In order to make ahead I spread a thin spread of butter before putting on the pimento spread. I also put in a lock & lock with wax paper @& damp paper towel between layers of sandwiches. They came out at the party like I just made them! 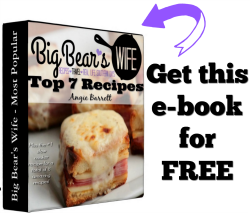 Love this recipe & and all the ladies & men in Tampa , Florida loved your recipe! Thanks so much! I’m so glad that y’all loved it! I love the idea of a little spread of butter before putting on the pimento spread on the bread! Just finished making this. Super easy and super delicious! We go to a Mediterranean cafe and they have this with pita and also as a sandwich. They put butter on the bread and throw it on the grill to toast and then add the pimento cheese (that’s how we’ll be having ours tonight) also making fried green tomatoes to try with it as well. Mmmm I bet Pimento cheese is amazing with pita! Your dinner sounds perfect! I’m going to make a big batch of this for a family reunion but I was wondering how long does this spread last in a air tight container? Thank you so much for this recipe. Can’t wait to try it. I crave pimento cheese sandwiches lol. Thanks for sharing your grandma’s recipe. My family is going to love it! I love them haha. They’re so good, aren’t they! Hope y’all love this recipe! I made a double batch and shared with a friend that is doing Keto too and she said it was the best she had ever eaten and my husband and I agree it didn’t last but a couple days. Do you have more Keto / low carb receipes? I just ate pimento cheese on a Hawaiian roll, lol, while I was reading this actually! I am branching out and trying to make new things at home and this is one I think I will be trying soon!! 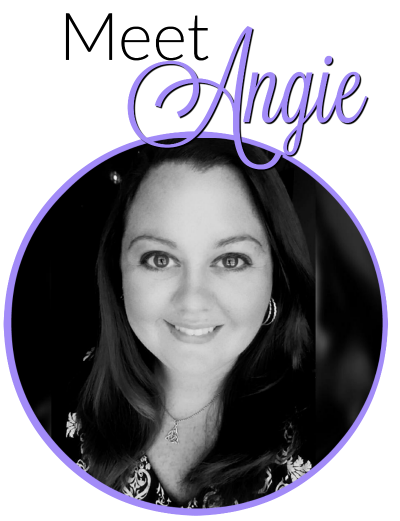 Thank you for sharing and I love your blog!! Thank you!! ooo Pimento cheese on a Hawaiian rolls sounds amazing! It makes about 2 – 2.5 cups of dip and the servings will depend on how you serve it. As a dip? as mini sandwiches? On rolls? As a sandwich? As a topping for fried green tomatoes? On Burgers? Serving size will depend on what you’re using is for. 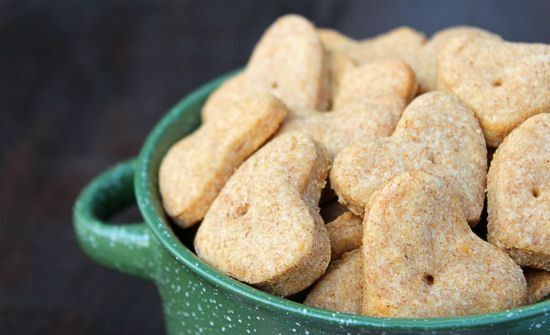 This is a totally addicting recipe! I made it for a tea sandwiches for 70 people in July and haven’t stopped making it since. I put it on the sweet Hawaiian rolls like you suggested and it is absolutely the best. 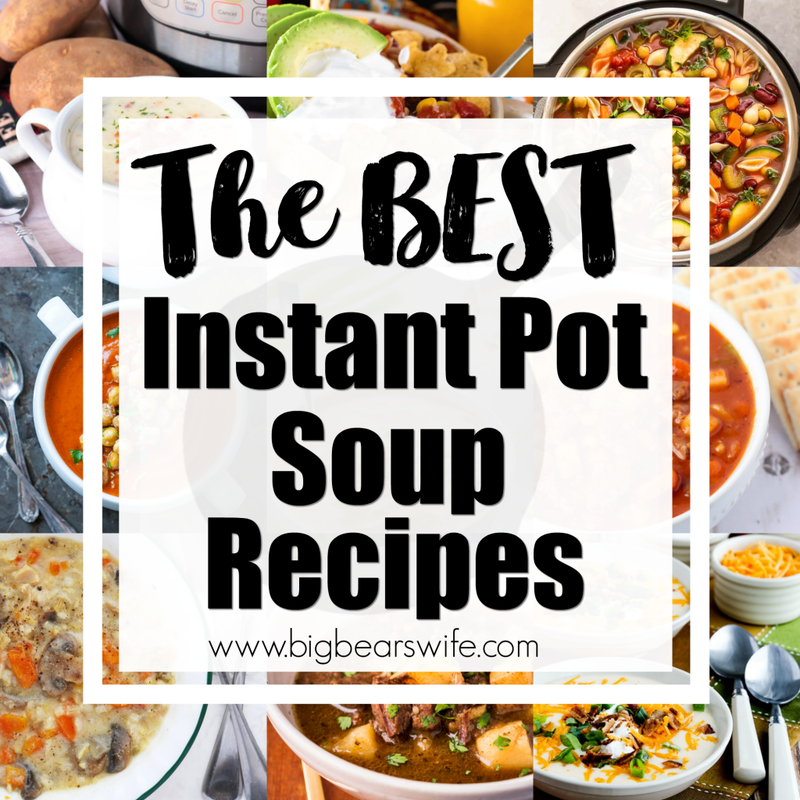 Thank you so much for the recipe it is my most requested share! Hi Pat! 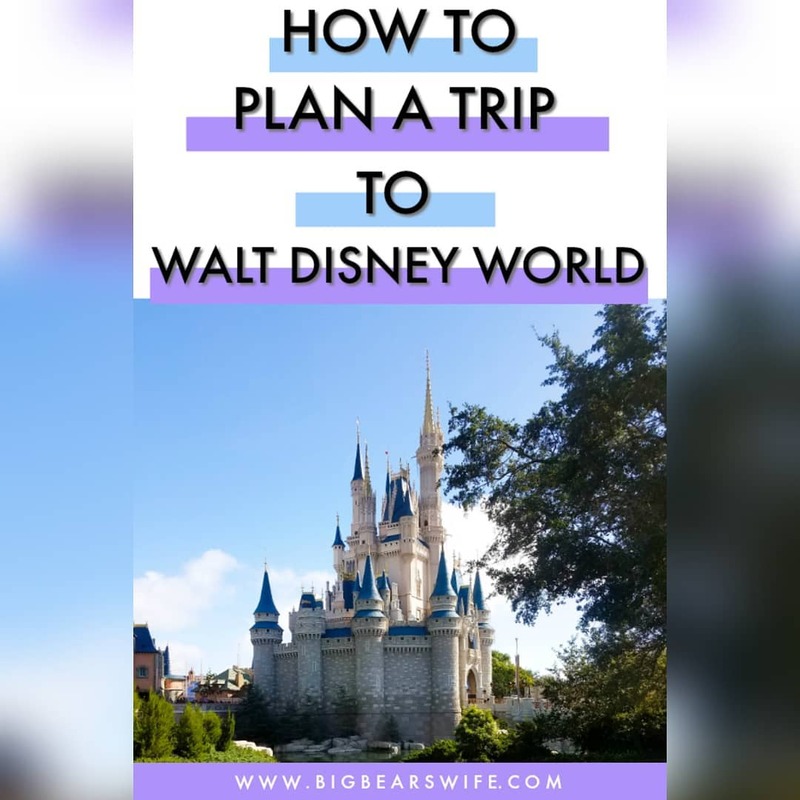 I am so, so happy to hear that this has become a favorite!! You made my day! I recently discovered grocery store pimento cheese, which I fell in love with. When I found your recipe I immediately bought the ingredients and made it. OMG…..absolutely delicious! My favorite dipper is pretzel crisps BUT because I respect my waistline I use it to stuff celery….all time favorite low carb snack. Many thanks for bringing this amazing recipe into my life! You’re so welcome! I’m so glad that you liked it! I love the idea of pretzel crisps with it! I never liked pimento cheese growing up. My family always bought the pre-made stuff from the store, and I hated it. Someone at church had made some pimeto cheese sandwiches for a potluck thing we were doing, and I took a little half-sandwich to try figuring maybe it would be better since I am now an adult and maybe my tastes have changed. Surprisingly, I liked it. I didn’t love it… but I liked it well enough. So… I decided I wanted some pimento cheese, but since I had bad memories of store-bought pimento cheese, I decided I’d make my own. I found your recipe a few months ago and made it. OMGosh! Amazing! I took some to my aunt and uncle… and they still talk about it and how wonderful it is. Thanks for sharing such a wonderful recipe. I made your Pimento Cheese Spread for a Christmas Eve Cheese tray, and it was delicious !! I had never made it before, but got so many compliments on it, that I will certainly make it again. Thank you for the super recipe. Love it! I love that you made it for Christmas! Hope you had a wonderful celebration! Um K? I was born and raised in Virginia and my grandmother did and I do……soooooo you do put it in there. Maybe not the kind you make but the kind we make is like this and it’s perfect. I made some last nite with 1/2 mayo and miracle whiip. I also used the small food processor to chop the pimentos finer. I do not use cream cheese in mine.